This is the final step of the process, you&apos;re almost there. Now that you&apos;ve set up your server and registered your website, you need to embed Commento on your website. For the sake of examples, let&apos;s assume you&apos;re hosting Commento at http://commento.example.com (you can change this in the backend). 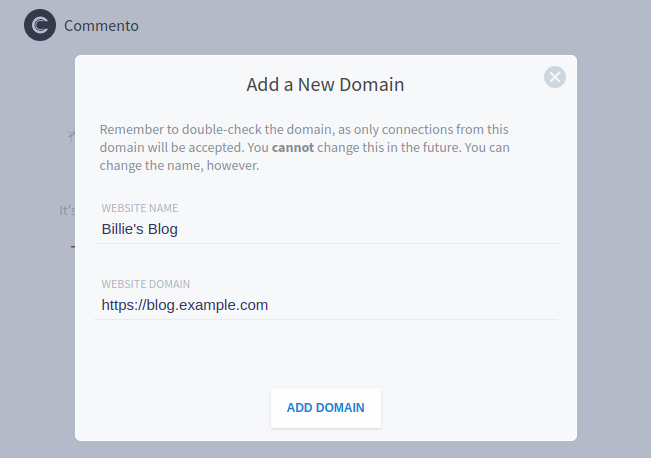 First, create an account in the dashboard (replace the link with your domain). Following this, log in with your credentials. Next, use the button on the left hand side to register your domain. That&apos;s it. Now Commento is ready to serve requests from your domain. Proceed to the next step to learn how to embed Commento on your website.